“Silicon Valley is coming”, Jamie Dimon, CEO of J.P. Morgan, anticipated in 2015. In his vision, this is due to “hundreds of startups with a lot of brains and money working on various alternatives to traditional banking”. After the $220+ million acquisition of WePay in October 2017, its first fintech move, the largest U.S. bank by assets has decided to step on the gas. This resulted in the launch of You Invest, investing app with a groundbreaking fee structure. It offers 100 free trades (stock or ETF) in the first year for new users, continuing thereafter for those having a $15,000+ Chase account and unlimited for Chase Private Clients ($100,000+ in holdings). User friendly and transparent, this constitutes serious competition for robo-advisors (automated investment managers) and online brokers. Share prices in TD Ameritrade and Charles Schwab declined after the announcement. Targeting millennials is part of the bank’s move towards unsophisticated, first-time investors. Indeed, 90 percent of You Invest users have not invested with J.P. Morgan before, and are on average 15 years younger than traditional clients. Now, three years after Dimon’s statement, J.P. Morgan is moving to Silicon Valley. In 2019, a new “fintech campus” will be completed at Stanford Research Park in Palo Alto, hosting more than 1,000 employees, in what is probably the most expensive commercial real estate market in the US. Its neighbors will be no less than HP and Tesla, with Facebook up north and Google to the south. According to the constructor, the project includes two 115,000- and 80,000-square-feet buildings, comparable to the latest innovation centers commissioned by Visa and Ford to host and attract new engineering talent. The 275 employees at WePay will also be transferred and its engineering team doubled, following plans agreed at the closure of the acquisition. ​Tina Hsiao, WePay COO, says that being under J.P. Morgan has benefited the company by bringing new partners and investments. “They’re able to distribute us. We’ve got a huge pipeline”, she added. J.P. Morgan’s Investment Banking office will remain in San Francisco. The bank's involvement in IBM’s $34bn acquisition of Red Hat has consolidated its second place in US tech M&A. 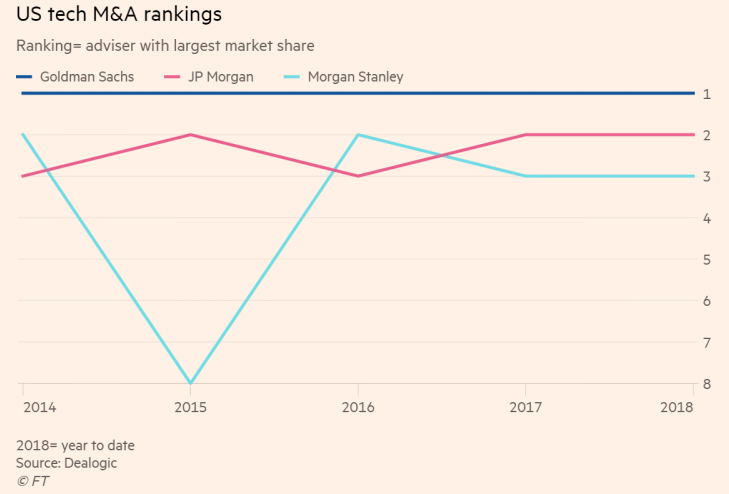 With Goldman Sachs retaining its top-of-the-league status and Morgan Stanley striving through 2018, Jamie Dimon is willing to strengthen the firm’s position even more. This comes also as a result of the departure of two of its top M&A executives. Kurt Simons, Global Chairman of M&A, joined Goldman Sachs as a Partner and Vice Chairman of its Investment Banking Division. Ethan Zweig, Co-Head of Technology M&A, is now a Partner at Qatalyst . ​Thus, J.P. Morgan’s Chief Executive has been an increasing presence in tech deals this year. Tim Maly, CFO of SurveyMonkey, whose recent IPO was led by the bank, said J.P. Morgan “impressed us with its dedication”. Furthermore, his direct involvement on EMC’s side during its takeover by Dell was the key to the closure of the deal and to a continued relationship with the client, as the bank can offer a wide range of products. Some employees do not favor his frontline role, arguing that his presence would not be necessary if they had an adequate pool of bankers. Some others outlined his ambassador role, stating that the San Francisco M&A team was the one actually closing deals. Smaller boutiques active in TMT may be perceived as more expert by tech companies, as compared to universal players such as J.P. Morgan. To contrast this line of thought, the continuous investments by the bank should act as an indicator of its long-term plan towards Silicon Valley.